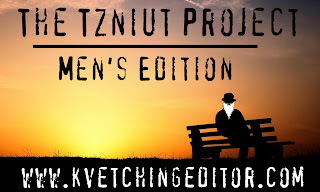 This is the first in the Men's Edition of a multi-part series called The Tzniut Project. 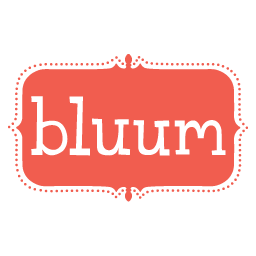 For the Men's Edition, men from a variety of backgrounds with a variety of observances have volunteered to anonymously answer questions that I have written about their practices, people's assumptions, and more. For more information on the project, click here. 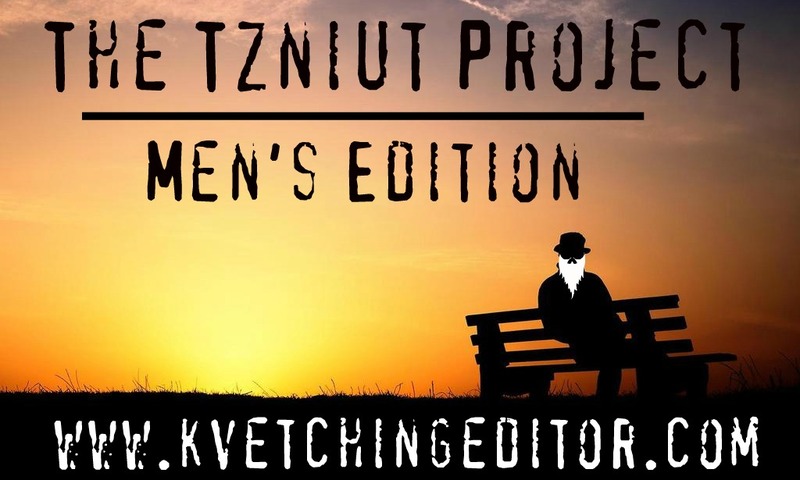 Please continue to check back with The Tzniut Project and the Men's Edition to read more stories! 2. I say modesty or tzniut … as a man, what does that mean to you? Keeping shirt buttoned, no shorts, not talking about private matters in public, using respectful language, separate seating, not going up to women to say hello, avoiding places where men and women mix. Not going to the beach. Avoiding places where women don’t dress appropriately. Being careful what I see and what websites I go to and what movies/videos I watch. 3. Growing up, did your father or grandfather wear a kippah or any other “modest” or recognizable Jewish dress? My father and grandfather both wore a kippah. My father always wore a hat of some type outside the house. 4. Do you think tzniut was something instilled in you by your family? Did you dress with any type of modest or recognizable Jewish dress growing up? My ideas of tznius I got from Yeshiva. Not sure that Jewish dress is related to tznius. 5. Are you married? How does your spouse feel about your choices regarding tzniut? 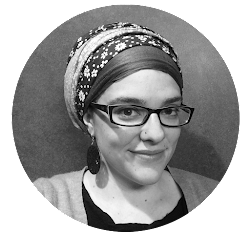 Is it a dialogue or does your partner leave the mitzvah to you? Yes I am married. My wife has much more stringent ideas of Tznius than I do. She would be very upset if I wore anything but a white buttoned dress shirt with a collar. Tznius in a marriage involves how what dresses and acts in the house alone and in front of others. Each couple has to work that out with each other. 6. What would you wear on a typical day? On Shabbos? If you dress or carry yourself differently on weekdays and Shabbos, why do you make this distinction and how? I tend to wear a white shirt, black pants and a black jacket. I also have a beard. I wear my tzitzis out. On Shabbos and Yom Tov I wear a black fedora and a tie. Why? Because wearing a black hat during the week will just get my hat ruined. The tie is in honor of Shabbos/yom tom. People think I am a rabbi, which is only partly true. 8. Have you ever surprised someone by way of tzniut, making them rethink their stereotypes about what it means to be an observant Jew? 9. When you see someone who observes tzniut or dresses differently than you, what are your initial thoughts? How do you deal with them? I judge people by the way they dress. I will assume they either belong to a particular Jewish grouping or they are totally mixed up and they don’t know what they are doing. I look to see if what they are wearing is consistent with their mores, their speech patterns, accents, and interests. 10. Anything else you’d like to add about your choices, experiences, and more!